Autographed Star Trek: The Motion Picture poster. Signed by (clockwise from upper right): Walter Koenig (Chekov), Majel Barrett (Chapel), DeForest Kelley (McCoy), George Takei (Sulu), Leonard Nimoy (Spock), Mark Lenard (Klingon Captain), Gene Roddenberry (Producer), Robert Wise (Director), Grace Lee Witney (Rand), Stephen Collins (Decker), William Shatner (Kirk), James Doohan (Scotty). Nichelle Nichols (Uhura). There were several items I picked up, one of which being a rather large purchase. 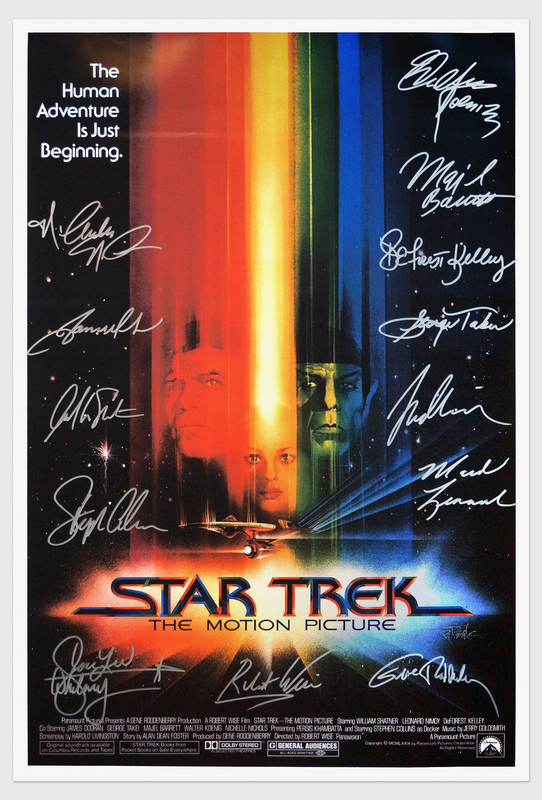 The main one being a Star Trek: The Motion Picture (ST:TMP) poster, signed by the entire main cast (with the exception of the late Persis Khambatta, who played Lieutenant Ilia) as well as Star Trek‘s creator, Gene Roddenberry and director of the film, Robert Wise. Wise was the Oscar-winning director of The Sound of Music, West Side Story, Run Silent, Run Deep, The Sand Pebbles, as well as the iconic sci-fi films The Andromeda Strain, The Day the Earth Stood Still and of course ST:TMP. He was a legend in the industry. Obviously, it would have been ideal if Persis had signed the poster—the artwork of which having been done by the renowned artist Bob Peak—but it is what it is. I am contemplating trying to run-down a stand-alone autograph of hers (preferably just a signature on paper/card and not a photo) and simply have that included with the poster when I get it professionally matted and framed. That she was basically a “guest star” in the film means in a way it would make sense to have her seperate from the rest of the regular original series/film cast. Though Stephen Collins, who played Captain/Commander Will Decker was also sort of a one-off guest star character who only appeared in the first Trek film, signed the poster itself. If both Persis and Stephen were signatures separate from the poster it would make a little more sense “conceptually” though it would also decrease the value of the poster slightly by having one less signature on it. But it would still be a way to make it “complete”. on August 2nd at the 2018 Las Vegas Star Trek Convention. Some of the other things I picked up were four different sets of autographs. One was of Nichelle Nichols, who originated and brought to life the character of Lieutenant Uhura on the original series. It was great to meet her and have a chance talk briefly. I conveyed to her that one of my favorite images was that of her meeting with President Obama, who revealed his inner Trek geek. Seeing the President give the Vulcan hand gesture of Live Long and Prosper with Lt. Uhura—whose role on Star Trek was actually pretty ground-breaking for American television—always brings a warm smile to my face. Two public figures who truly do represent the best of us. 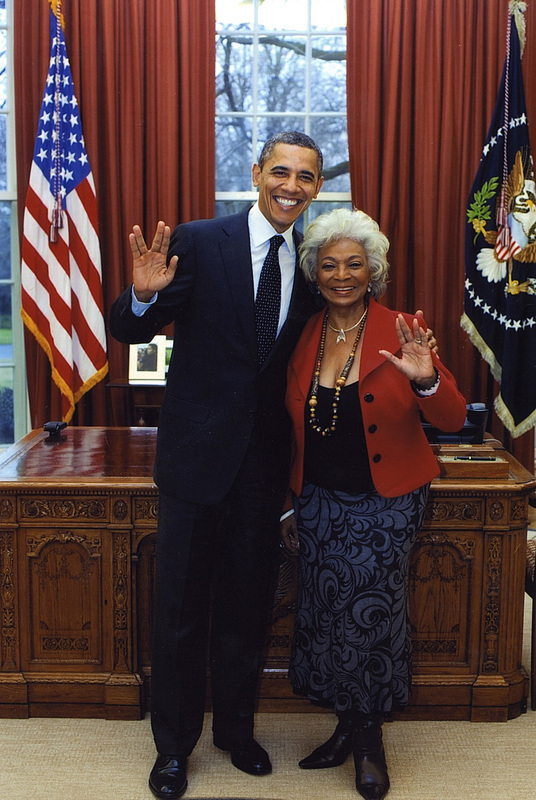 President Barack Obama flashing the Vulcan salute with groundbreaking Star Trek actress Nichelle Nichols during a White House visit on April 4, 2012. Nichelle’s role as Uhura was one of the first times that an African-American actress portrayed a non-stereotypical role on television. Previously, most African-American female characters on American television were depicted as maids or housekeepers, and Nichols’ role helped break that barrier. Nichols participated with series star William Shatner in another breakthrough, with American “episodic” television’s first interracial kiss between fictional characters, in the third season’s episode “Plato’s Stepchildren“. That Nichols was playing Uhura in the third seasons is actually an interesting story in that Nichelle had actually decided to leave the original Star Trek series after the first season. However she withdrew her request to leave which she had made to Roddenberry after Dr. Martin Luther King, Jr. convinced her that her role was a too important cultural breakthrough to leave. 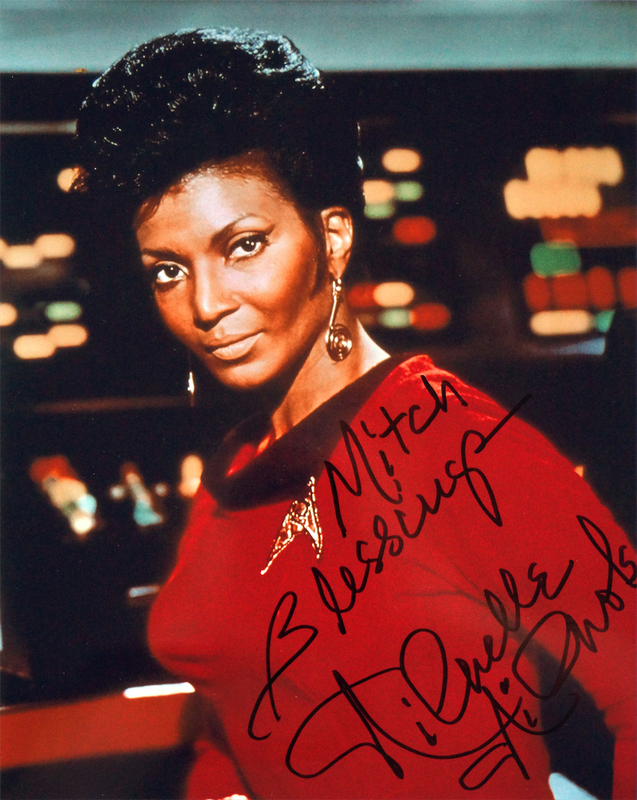 Nichols went on to become the first African-American actress to place her handprints in front of Hollywood’s Grauman’s Chinese Theatre, along with the rest of the Star Trek cast. In 1992, she earned her star on the Hollywood Walk of Fame. She is a great lady and a true icon. Another actor who was at the convention was Gary Lockwood who played Lieutenant Commander Gary Mitchell in the second pilot for the original series Star Trek, called “Where No Man Has Gone Before“. Interestingly, a few years later he also appeared in another sci-fi series pilot, this time for a show called Earth II which never went into series, though the pilot went on to be released as a made-for-televison movie. However Lockwood is probably best known for his role as astronaut Frank Poole in the film ground-breaking film 2001: A Space Odyssey. 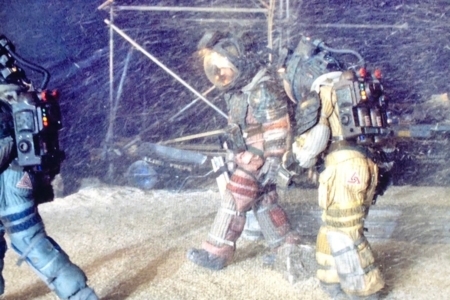 His character is memorably killed while carrying out an EVA to replace the AE-35 unit in the main antenna of the spacecraft Discovery One by the ship’s HAL-9000 computer. 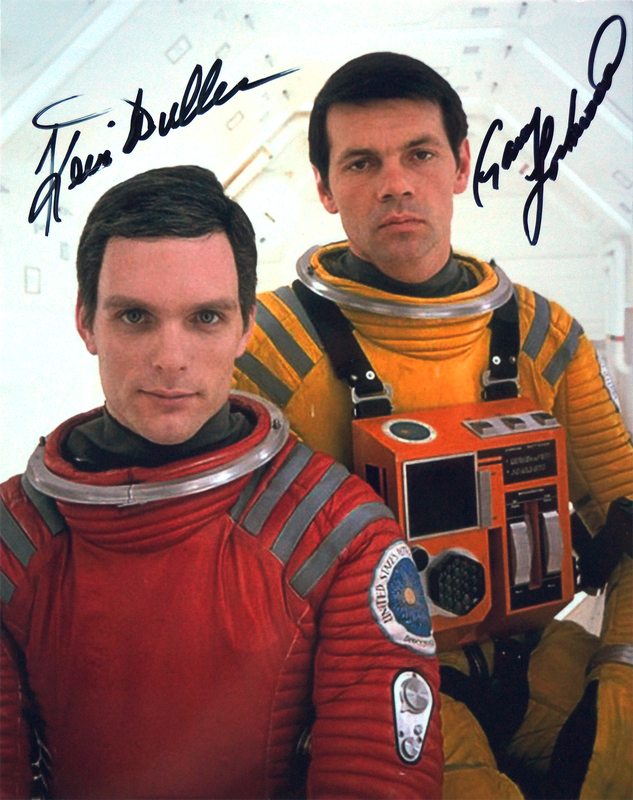 I had him sign a publicity shot for 2001: A Space Odyssey which he had previously had his co-star on the film, Keir Dullea who portrayed astronaut David Bowman, sign at an earlier event. In addition to that signed 8 x 10 photo, I also picked up a print of the iconic Robert McCall one-sheet poster art for 2001. The artwork they had on display at the convention—which I took a photo of and show here—was one that had only Gary Lockwood’s autograph on. 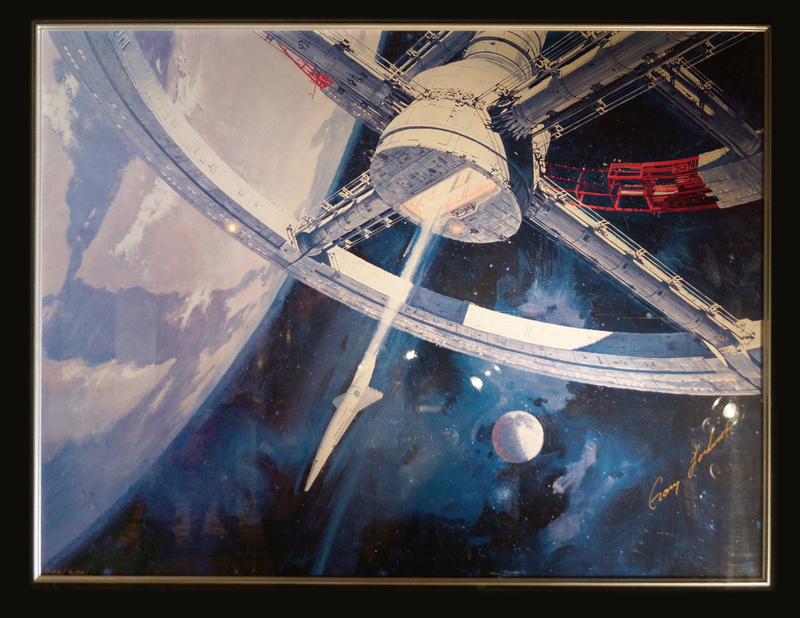 The piece I purchased actually has both Lockwood’s as well as Dullea’s autograph on it. That is being shipped from the dealer who sold it to me. Once it arrives I will get it professionally photographed and post images of it here on this blog. 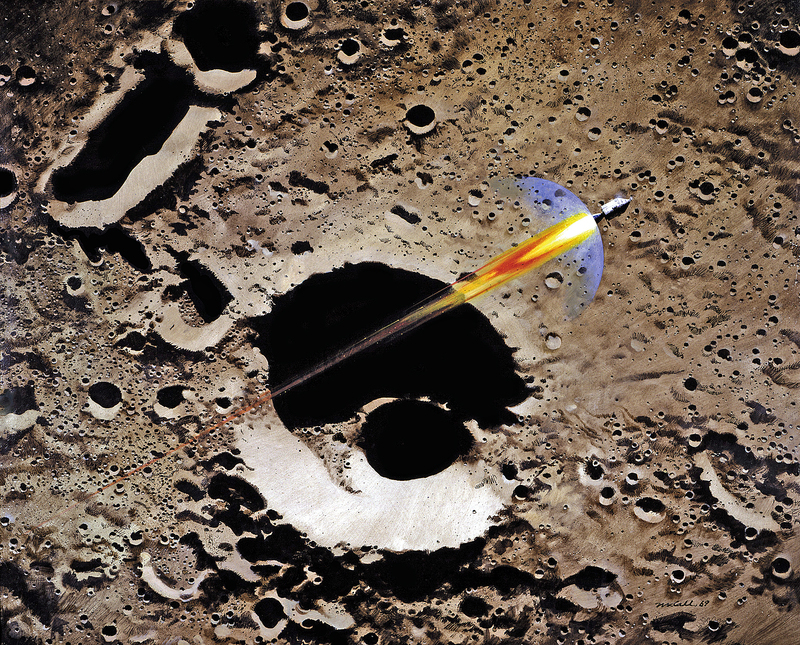 As previously mentioned, the poster art was done by renowned artist Robert McCall who worked as an artist for NASA, documenting the history of the Space Race. His work can be found on U.S. postage stamps as well as NASA mission patches such as the one for Apollo 17. His murals grace the walls of the National Air and Space Museum, the National Gallery of Art, The Pentagon, Epcot, and Lyndon B. Johnson Space Center. window POV shot in a scene from ST:TMP. McCall also had a direct connection with ST:TMP. He did some concept paintings, mostly of V’ger. However two of his earlier NASA paintings where put into the Officer’s Lounge miniature used for an interior window POV shot as the Vulcan shuttle carrying Mr. Spock rendezvous with the Enterprise. The McCall painting on the left in shuttle arrival shot from inside the Officer’s Lounge was painted in 1969 and is titled “Apollo 8 Coming Home”. It is in the collection at the Smithsonian’s National Air and Space Museum. 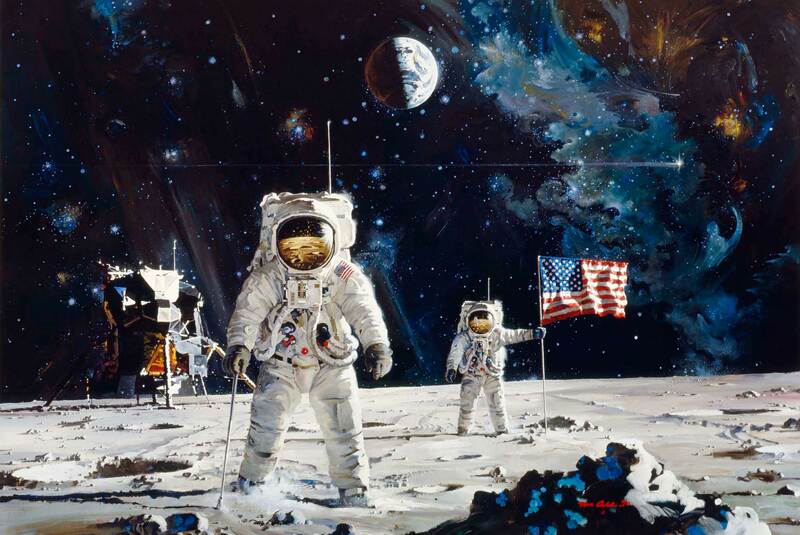 The other McCall painting—on the right—was painted in 1971 and is titled “First Men on the Moon” and is in the collection of Broadway National Bank in San Antonio, Texas. Robert McCall’s 1971 oil on canvas painting titled “First Men on the Moon” in the collection of Broadway National Bank, San Antonio, Texas. Down the road—and detailing both my 3D as well as physical model of the Enterprise‘s Officer’s Lounge—I will utilize the above images to accurately decorate the lounge’s interior. 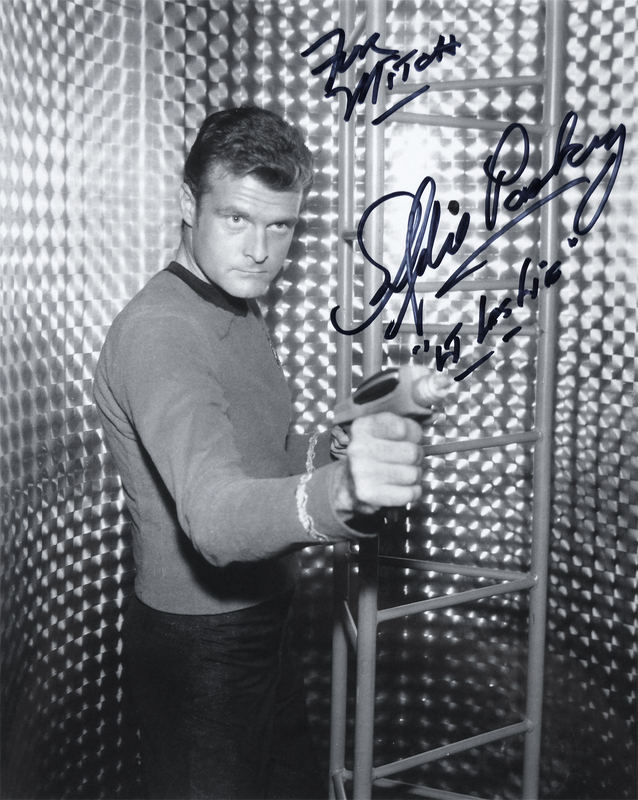 One of the other autographs I picked up was of Eddie Paskey, whom one might call a sort of an un-sung hero of Star Trek. He is an actor known mainly for his role as Lieutenant Leslie, a recurring supporting character on the original series. 2018 Star Trek Convention in Las Vegas, Nevada. While Paskey only had scripted lines in four episodes and only credited in two of them, he actually appeared in more episodes than principal characters Sulu or Chekov. He first appeared as a “crewman” on the second pilot episode “Where No Man Has Gone Before,” and was first identified by name in “Mudd’s Women” in an early scene where Doctor McCoy refers to him as Connors. In subsequent episodes, he was cast regularly as a crewman, but also appeared as a security officer, a helmsman, an engineer station officer, even an alien, all to create a sense of familiarity on Star Trek during the series’ run. While he played other parts in Trek, when talking to Eddie, he told me how the character he was best know for portraying in the series finally got the name “Lieutenant Leslie”. Well it turned out it was all because “Leslie” is the name of Shatner’s eldest daughter. So in the middle of a take in one of the bridge scenes Shatner simply referred to his character by the name “Lt. Leslie” and it was used from then on for that character. So on a spur of the moment act, Shatner bequeathed him his name on-set. He also told me two other great stories. One was how he managed to avoid being killed when one of the “red shirt” extras were going to be killed off in a scene. Though it must be pointed out that Lt. Leslie did “die” in the episode “Obsession” though he mysteriously was alive again in the very next episode “Wolf in the Fold“. But we’ll skip past that little bit of a continuity error and back to Eddie’s story. How Paskey managed to keep Lt. Leslie alive was basically due to him being friends with someone who was involved with handling the scripts on the show. So he would get a little inside info from his friend whenever some crewman was going to bite the dust during the episode they would be filming that day. With that heads up from his friend, Eddie would conveniently make himself scare until the director picked someone else to be the victim. 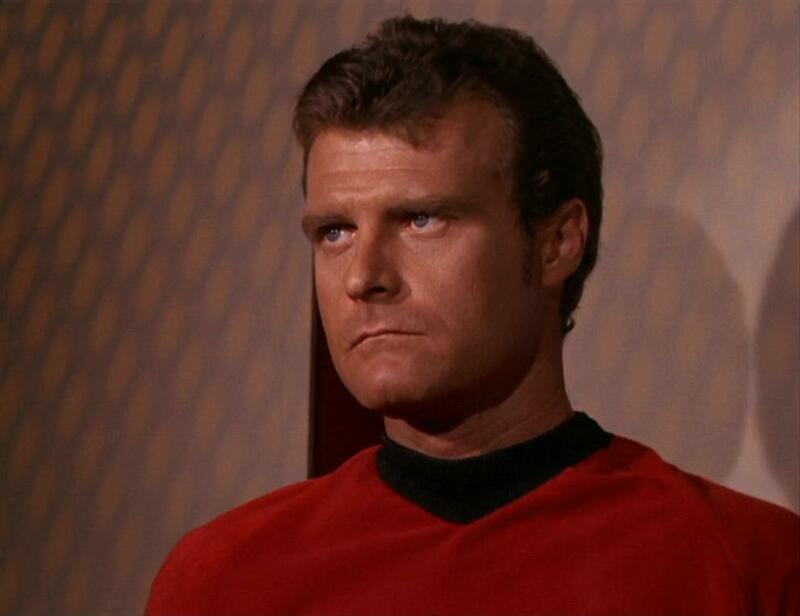 Eddie Paskey as Lt. Leslie in the original series Star Trek. The other story he told me was how Leonard Nimoy famously kept his bike on the soundstage so he could jump on it a quickly get to the commissary on the studio lot quicker than others, in order to grab lunch faster than everyone else. This in turn lead to other cast members pranking Nimoy and messing around with his bike. This escalated to the point where Nimoy began putting his bike in his car and locking it up to keep it safe. Well Eddie’s background was a mechanic. So Shatner asked him if he could jimmy the lock on Nimoy’s car so they could get their hands on his bike. Eddie obliged and managed to defeat the lock. Once they had Leonard’s bike in hand they got one of the stage hands to hoist Nimoy’s bike up into the rafters of soundstage nine, where they filmed most of Star Trek. That particular day they were filming a scene where Spock was laying in bed in sickbay. So he’s laying on his back as they are rehearsing the scene when Nimoy suddenly notices that his bike is dangling right above him way up in the rafters. This caused him to jump up and scream “hey, that’s my damn bike up in the rafters!” much to the delight of the rest of the cast and crew. 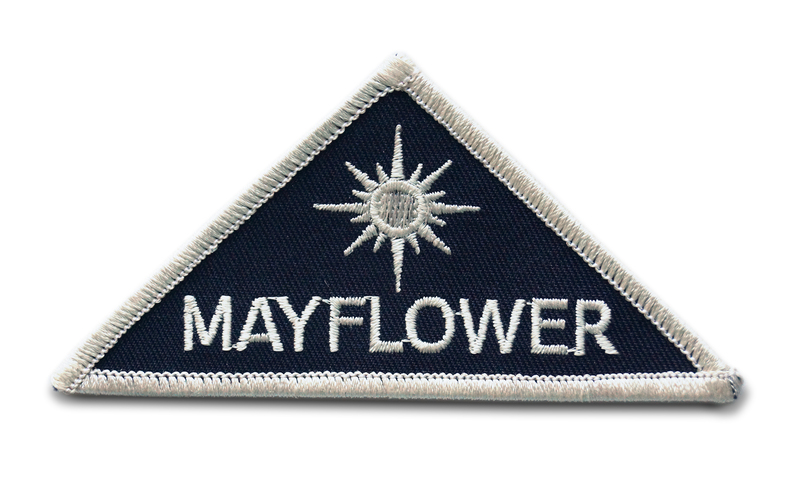 Project Mayflower mission patch from Close Encounters of the Third Kind. Some of the other items I picked up at the convention were some embroidered insignia patches from several classic genre films. The first one is a rather obscure one though it is from a very popular Steven Spielberg film. It is the “Mayflower Project” mission patch from the movie Close Encounters of the Third Kind. Mayflower Project flag in a scene from Close Encounters of the Third Kind. The “Mayflower Project” was the organization devoted to studying extraterrestrial life. It was their multinational team in the movie that was investigating UFOs and was headed in the film by Claude Lacombe—played by legendary French film director François Truffaut. Also on the team was David Laughlin—Lacombe’s assistant and English-French interpreter—played by Bob Balaban. The Oscar nominated actor Balaban has been in multiple movies but his best known genre role is probably that of Dr. R. Chandra in 2010: The Year We Make Contact—the sequel to 2001: A Space Odyssey. Another team member portrayed by someone who would later become a more renowned actor in sci-fi films, played a minor character on the Mayflower Project team named “Robert” in Close Encounters. This was one of the first genre appearances by Lance Henriksen who famously went on to portray Bishop in the Alien franchise, and appeared in the first Terminator movie as well as many other genre films and shows. by emissary team members in the final scenes of Close Encounters of the Third Kind. The triangular “Mayflower Project” symbol itself was not very prominent and only appeared briefly in the film in a few places. It was on one of the flags hanging in the auditorium where the project’s leader Lacombe gives a lecture about the tonal “message” that had been received by thousands of UFO witnesses in India. In that same scene, the symbol can be spotted on the folders being distributed to the audience at the lecture. It again appeared on a flag at the code-named “Dark Side of the Moon” site set up by the military and the Project at the base of Devil’s Tower in Wyoming. as a meeting location to make contact with the aliens. However it is most noticeable as the patch on the left sleeve shoulder of the maroon colored jumpsuits which were worn by team members trained as exchange emissaries with the aliens should they accept. The main character—Roy Neary, played by Richard Dreyfuss—is hastily included in the group at the urging of Lacombe, and ends up being the one chosen by the aliens to go with them on their mothership and leave earth in the finale. the final scenes in Close Encounters of the Third Kind. 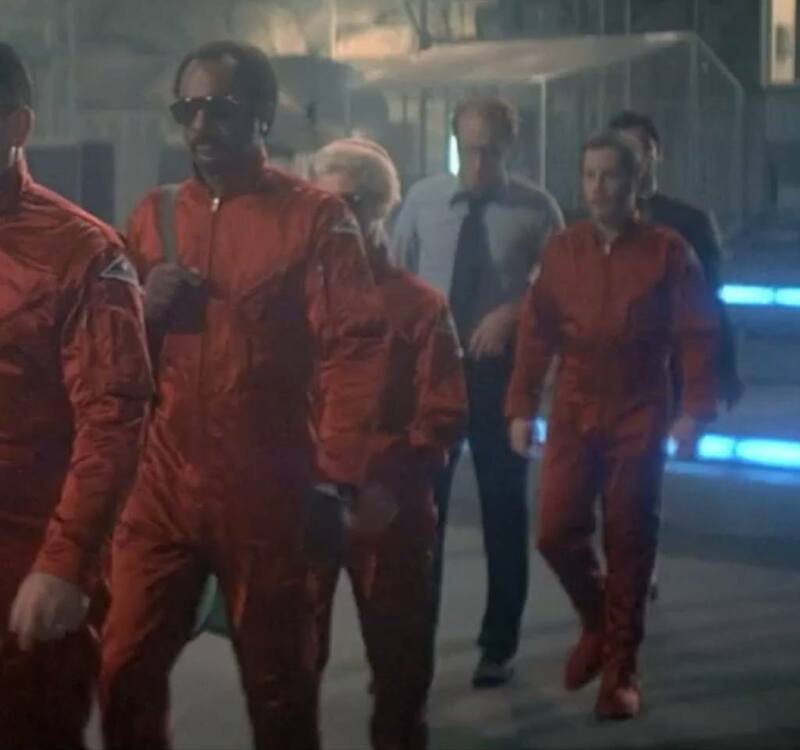 The jumpsuits used in the final scenes of Close Encounters are reminiscent in my mind to the clean-room “bunny suits” used by NASA or JPL in spacecraft assembly and are visually echoed in the often maligned jumpsuit uniforms used in ST:TMP. I know I am in the minority among the Trek fanbase when it comes to the uniform costumes of ST:TMP, with many derisively referring to them as “pajamas”. To my mind that have more of the look and feel of actual spaceflight attire than the somewhat campy looking uniforms of the original series, or even the more militaristic wrap-around burgundy colored pea coat/blazers of the later films. 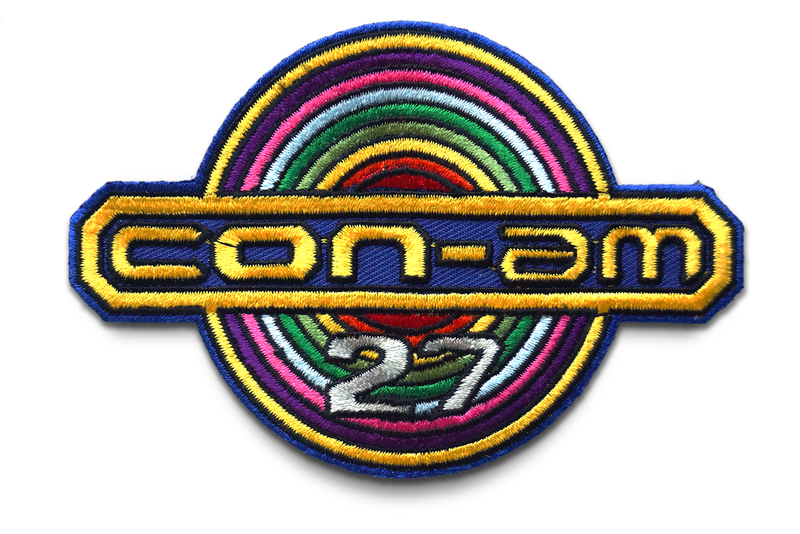 Another embroidered patch I picked up was the Con-Am 27 patch from the Sean Connery sci-fi movie Outland directed by Peter Hyams. Outland was a 1981 sci-fi film that received mixed reviews upon release. While the film did manage tp recoupe its production costs at the box-office, it wasn’t a huge hit. That said I actually like the film quite a bit. It has the same sort of “used” industrial futurism seen in both of Ridley Scott‘s iconic films Alien and Blade Runner. While much more straight-forward a story—many have compared to the classic 1952 western High Noon only set in space—the film actually has a very real grounding and plausibility that supersedes the more fantastical and cerebral (respectively) Scott films. That’s not to say I have issues with either of those other films. I consider both of them to be masterworks. With Blade Runner being a truly staggering accomplishment which still inspires awe to this day. mining station patch from the 1981 sci-fi film Outland. The Con-Am 27 patch is a screen-accurate reproduction of the company logo for Conglomerates Amalgamated titanium mining station 27 on Jupiter’s moon of Io, which was the setting of the film. The patch is seen being worn by virtually everyone on the mining station—a space version of an ugly company town. 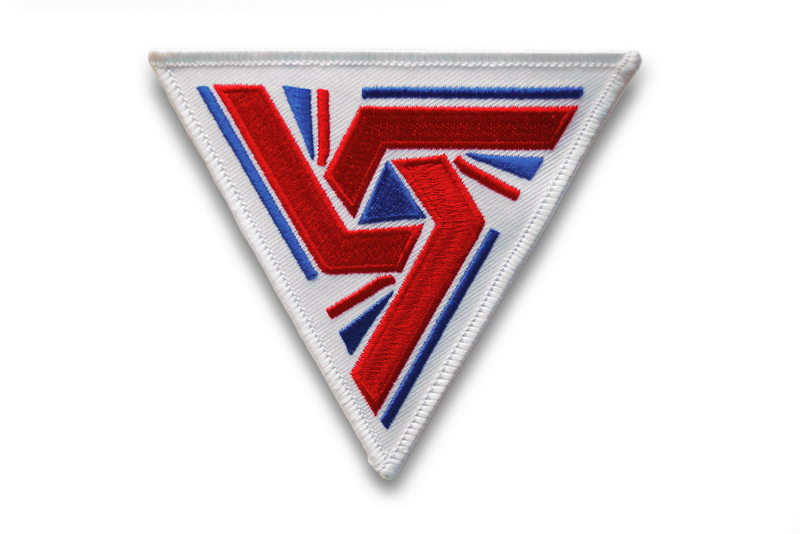 The design of the patch is very reminiscent of the Nostromo ship’s insignia patch from Alien. One of many visual similarities between the two films, even though done by different directors, studios and production teams. Hyams made some genre films besides Outland. He had previously directed Capricorn One, and after Outland would go on to direct 2010: The Year We Make Contact. 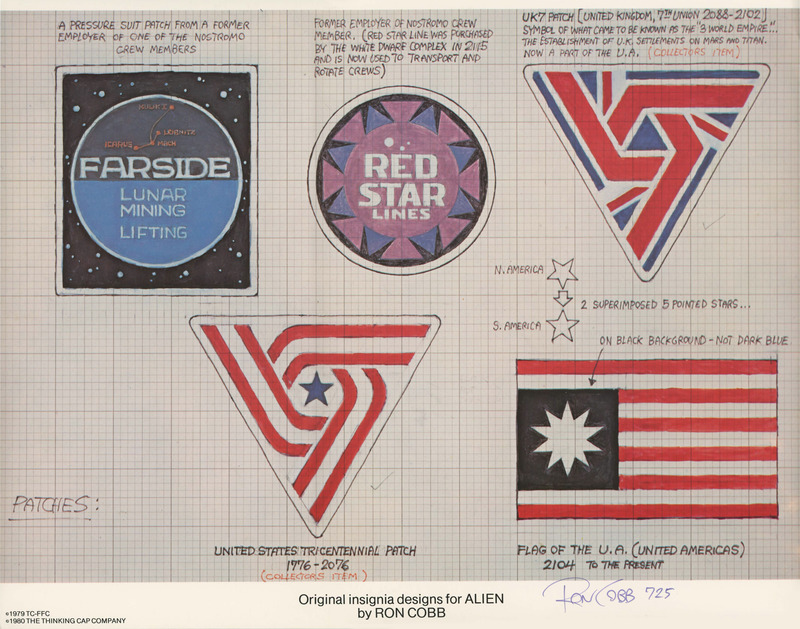 Embroidered UK-7 patch, designed by Ron Cobb, for the 1979 film Alien. The last embroidered patch I picked up at the convention is a reproduction from that very film—Ridley Scott’s Alien—though it isn’t the aforementioned Nostromo patch. It is actually a very obscure one. It is the United Kingdom, 7th Union Jack symbol. The UK-7 symbol is one of two commemorative symbols designed by Ron Cobb for the 1979 film Alien, that were worn as patches by the crew of the USCSS Nostromo, along with being used in a few other applications. So with the Union Jack representing the unification of those Earthbound nations as the United Kingdom, the UK-7 symbol represents the “7th Union”, bringing together Earth’s UK with colonies founded on the planet Mars and Saturn’s moon Titan. This earned it the title of the “3 World Empire”, and is likely the reasoning behind the symbol’s three arms spiralling together in unity. So this explains why we see it worn by Executive Officer Kane, the only member of the crew who was not born in the United Americas (the U.A. referenced in Cobb’s sketch notes). It also attempts to nail down the correct orientation of the mark as point up. 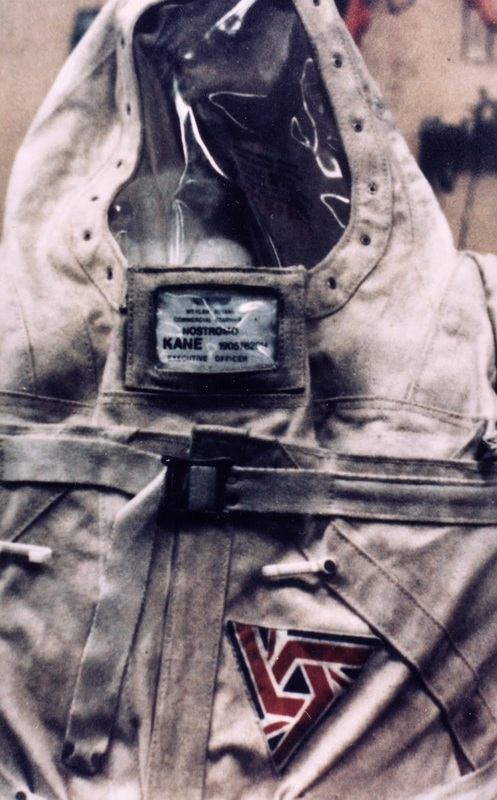 This is how it is worn in the film — on the buttocks of Kane’s space suit (Figure 1.2). You can barely make it out, if you look carefully at the scene where they board the elevator to descend from the Nostromo to the surface of LV-426. And costume designer John Mollo discusses the symbol as it was applied to Kane’s suit, and gives a closer look at the patch, in his interview seen in The Alien Legacy. Contrary to that application, in Cobb’s drawing the symbol points down. And in a few instances that aren’t really seen in the film, on props, the mark is used with the point facing down as well. 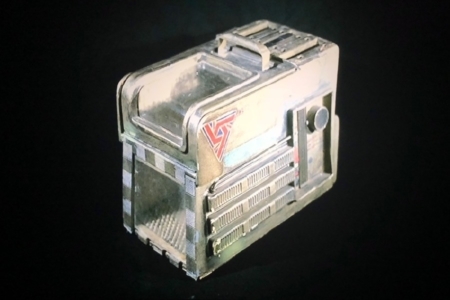 In one of these, it is sewn onto Kane’s death shroud (Figure 1.3), and the other is when it is applied as a decal to the cat carrier Ripley uses to ferry Jones to the lifeboat shuttle (Figure 1.4). The flip in orientation is probably just a continuity error resulting from so many people working on the project, at different points and times, with no established guidelines to adhere to. It’s interesting to think, when seeing this sort of thing, that even a fictional identity for a story can benefit from a graphic standards manual. If an identity is going to be believable, it should be recognized within that world as something that is applied and understood uniformly. For example, what if in a movie we saw instances of a present day symbol we are familiar with, like the US flag, but it was turned upside down for certain applications. It would be odd, because it breaks from the accepted appearance of a symbol and how it used, and introduces the possibility of an alternative meaning being communicated due to the change — for instance, an upside down US flag is a signal for distress. So, for the sake of solid world-building, it’s worth sticking to some established rules, and only breaking them with good reason. Cobb went on from Alien to be the Production Designer for the 1982 fantasy classic, Conan the Barbarian, staring Arnold Schwarzenegger and James Earl Jones. This entry was posted in Projects and tagged 2001: A Space Odyssey, 2010: The Year We Make Contact, Alien, autograph, Capercorn One, Close Encounters of the Third Kind, Con-Am 27, convention, DeForest Kelley, Eddie Paskey, Gary Lockwood, Gene Roddenberry, George Takei, Grace Lee Witney, Ilia, James Doohan, Kane, Keir Dullea, Leonard Nimoy, Lieutenant Leslie, Majel Barrett, Mark Lenard, Martin Luther King, Mayflower Project, NASA, Nichelle Nichols, Officer's Lounge, Outland, Patch, Persis Khambatta, Peter Hyams, poster art, Richard Dreyfuss, Ridley Scott, Robert McCall, Robert Wise, Ron Cobb, Sean Connery, Star Trek: The Motion Picture, Stephen Collins, Uhura, United Kingdom, Walter Koenig, Whoopi Goldberg, Will Decker, William Shatner. Bookmark the permalink. It’s a little more colorful, not sure if the colors are over-saturated, but it is very detailed. I would love see to see your photo of the print if you do end up posting it. I love that piece, but can never find a nice, hi-resolution version of it. Nice post, and thanks! Hello Nick. I have not gotten around to having it professionally photographed. And it may be a while until I do. This is mainly due to me having a large backlog of “to do” items around my geek hobbies. I will definitely post it and ping you when I do.